AdressNo.15, Langwan Oversea industry Park,Long'an,Nanning,Guangxi,China. MW: 36000-50000 (Dextran sulfate sodium salt MW: 36000-50000. Dextran sulfate sodium salt is a kind of organic sulfur containing sugar medicine, is a kind of white or light yellow powder, hygroscopic, slightly sweet and salty. Easily soluble in water, acid, water solution microscopic pH5.2 ~ 6.5. [applications] Dextran sulfate sodium salt of this rising star drugs. Proved by extensive pharmacological testing, has many good pharmacological effects to the human body. 1, fall hematic fat action Dextran can activate and enhance the activity of esterase organization ester protein, esterase ester protein and prompted the organization free into the bloodstream. Decomposition chyle particles, reduce the CH and TG and prompted the Hd - CH increases, reduce atherosclerosis index. 2, Anticoagulation Dextran improve the vitality of fibrinolysis system. Lower blood coagulation factor V and VII of the dynamic speed, and has anticoagulant effect, 1/10 of the heparin activity effect, oral medicine in the gut after part of desulfurization, make less anticoagulant potency in the body. 3, Of myocardial metabolic effects of low molecular weight Dextran (2000 ~ 3000) can improve myocardial glucose focus, alpha glutaric acid and lactic acid absorption and utilization, promote the K+ into the myocardium and make the Na+ outflow, improving myocardial metabolism, and eliminate atherosclerosis with self-conscious symptom. 4, the new drug is the treatment and prevention of AIDS. 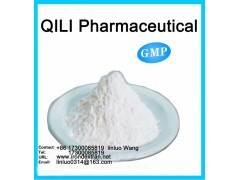 The recent research results show that the Dextran sulfate sodium salt is used for the prevention and treatment of AIDS in the world one of the most effective drug. 3000 molecular weight Dextran sulfate sodium salt can not only on the outside of the cell, the virus and can easily enter the infected cells, kill the virus in cells. Our factory in strict accordance with the Japanese StandardJP XIII. Stable and reliable products, quality excellent, welcome new and old customers to use.